When it comes to high-quality siding that is designed to last for decades, James Hardie fiber cement siding from Windows Plus is tough to beat. This type of siding is formulated for our local climate in Louisville, Kentucky, and southern Indiana, and will therefore stubbornly hold up to the elements year after year without deteriorating or fading. Maintain its shape in wet weather – Other siding materials can warp, buckle, or crack when exposed to heavy rain or snow, but Hardie Board siding will hold strong and resist rot and other moisture damage. Repel impacts – Debris that is kicked up by heavy winds won’t dent or crack this type of siding. Never ignite or burn – The composition of fiber cement ensures that it will never ignite or act as fuel for a fire, so this siding may qualify you for benefits from your insurance company. Resist damage from insects and birds – Because there is no wood in fiber cement siding, termites and woodpeckers will have no interest in it, not that they could penetrate the siding’s ultra-durable shell if they did. Look like new for decades – James Hardie siding is available with baked-on color technology, which will ensure it maintains its vibrant color year after year. 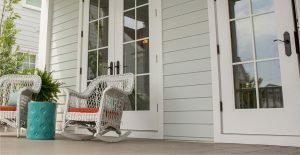 If you’re lucky enough to own one of the historic homes in Old Louisville or similar districts in Kentucky or southern Indiana, fiber cement siding is the right choice for you. At Windows Plus, we’re proud of our community and are happy to help preserve its history with hardwearing siding that will stand the test of time. Of course, you don’t have to be located in a historic district to take advantage of our fiber cement siding installation service – if it’s simply a matter of providing the best product possible for your home, we are here to help. For more information about fiber cement siding and how it can improve your home in Louisville or elsewhere in Kentuckiana, contact Windows Plus today. When you do, be sure to ask about the lifetime warranty that we’ll include with your project.